The Ukrainian Sea Ports Authority, Odesa Maritime Merchant Port and Brooklyn-Kyiv Port LLC with the participation of the French company CMA CGM, the world’s third largest container carrier, have signed a memorandum of understanding in France, the Ministry of Infrastructure has reported. “The development of cooperation between the Ukrainian Sea Ports Authority, Brooklyn-Kyiv Port and CMA CGM is another example of effective public-private partnership. As part of this project, berths Nos. 13-z, 14-s will be reconstructed in Odesa,” Head of the Ukrainian Sea Ports Authority Raivis Veckagans said. According to him, this will allow avoiding vessel idleness and significantly increasing the volume of cargo handling. 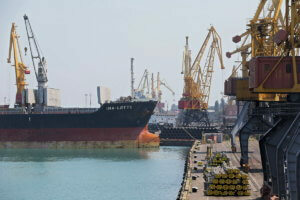 “The signed memorandum gives hope that in the near future a large-scale infrastructure project will be implemented in Odesa seaport, which will attract investment in infrastructure development, increasing cargo traffic and the number of ship calls at the port,” Minister of Infrastructure Volodymyr Omelyan said. CMA CGM Group is a shipping company headquartered in Marseille. According to the Ministry of Infrastructure, it is the largest sea container carrier in France with the total deadweight of 2.208 million TEUs, operating with a fleet of 445 vessels and servicing more than 420 ports in the world.